Villa Mystic is located on St. Jean Hillside. A breath taking panoramic view over the bay of St. Jean with the Eden Rock as the centerpiece. The Nikki beach is within walking distance. There is a large living room and it is decorated with a large Boudha and abstract paintings. The living room opens onto the dining area and there is a large teak table that seats twelve. There are five spacious bedrooms, each with a private bathroom. The 5th bedroom is located on the lower level and has privacy . The pool has dark blue tiles and teak lounge chairs. All bedrooms have breath taking views.There is a second sitting area outside on the deck by the infinity pool. Mystic is a beautiful villa where you can rest in a calm and peaceful environment. You will feel at home and come back to see us. We offer maid service daily, except for Sundays and bank holidays. A complete personalized service (on call 24 hours) to suit you. You will have a wonderful time. You can walk down the hill for a swim or breakfast in St. Jean. The best location in town because you are in the center of the island. Please call me direct for further information (my name is Peggy), or send me an email. A BIENTOT! My name is Maite Nouaille. I am an interior Designer, came to St. Barths the first time in 1982, and came back ever since. This tiny island rock is in my heart, and once it grabs you, you are in trouble- you will always come back. There's something a little special about St. Barths, it is not so much how it looks, or how it is, it is how it makes you feel. I simply fell in love with the island; the first time I landed with the small airplane- I was glad to arrive! The island is beautiful, you feel free in St. Barths. You can get-up the morning, go for coffee at Maya's to go , you'll always meet someone you know. Then exercise in nature: start walking, go swimming or sailing. The light is magical and ever changing. The island is unique, everywhere you look, it's beautiful. The beaches all have their own personality. Above all, the island is safe, and people are friendly. Awesome Villa - Amazing View - Gracious Hostess!! Wow! 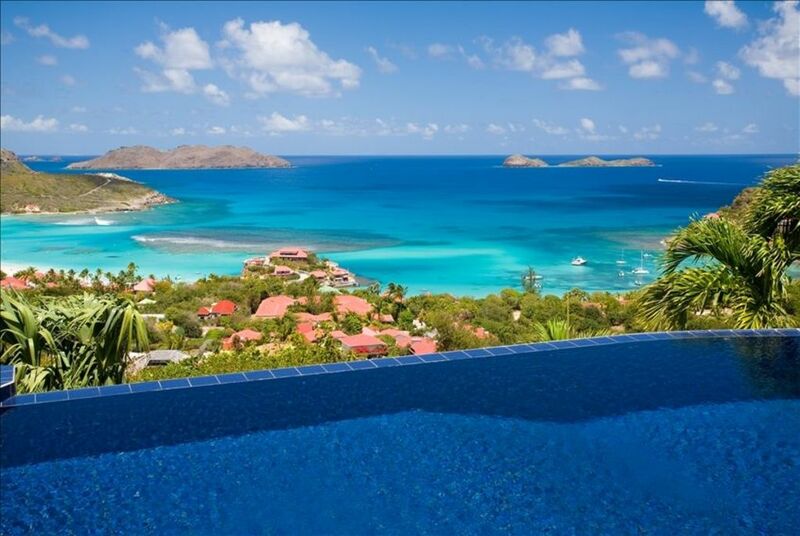 Where to begin regarding Villa Mystique, Peggy (the Owner) and St. Barth's. My party and I were greeted at the airport. The owner arranged for the collection of my luggage and had it sent UP (yes, up) the hill! This gave me the proper time to grab a car and get quickly acclimated to the local traffic. The owner drove my party up the breath taking hill to Villa Mystique where we were greeted by a breath taking view of Nikki Beach, and Nikki Cove. The Villa is complete with a infinity edge pool that looks as though it drifts into the ocean. This six bedroom Villa was exquisite, and well suited for our party of 9. We were never infringing upon each other, with plenty of space to relax and enjoy the beauty. The owner was gracious to take the time to point out the Do's and Don'ts of St. Barth's and was willing to do everything possible to ensure we had a fantastic time. The villa is plush with all amenities of your home in the states. We prepared breakfast and lunch at our leisure and dined out and enjoyed the local fare in the evening. This was my first time renting a Villa (outside of a hotel resort). I was skeptical of the quality. I was overwhelmingly pleased with the Villa, our stay and would book the same exact trip and villa next time I travel to St. Barth's. The Nightlife of St. Barth's was awesome. It was clean, Crisp and very European! we have teenagers in our party, and never once did we feel like safety was an issue!. There are several local grocery stores and the local are friendly and accommodating. This was a first class vacation and the Villa and the owner all but reinforced the outstanding accommodations that we enjoyed. Take my word, don't pass on this opportunity. You will regret it if you don't book Villa Mystique and Peggy! Best View of St Jean! The best part of the Villa was the owner, Peggy. She was at our service the entire stay. She helped arranged dinner reservations & our taxi. We loved taxi driver # 18 , Guillaume he was awesome too. He followed through every day to confirm our nightly needs. The Villa was laid out nicely providing separation between rooms. There was one upper deck room and two lower deck rooms that were removed from the three main rooms across from the pool providing a little more privacy. We were traveling for spring break there were 48 of us total that rented 7 different villas . We all agreed ours had the best view! The only complaint I would have is the towels. There were 9 of us that rented the villa and only 5 beach/pool towels were provided. Additionally we never got clean towels for the bathrooms. If we wanted towels washed it would cost 35 Euros per load. For the price of the villa clean towels should be provided daily. Other than the towel situation we loved our stay! Thank you Peggy you were the hostess of the mostest! ❤️👓�🎶�💕�Merci beaucoup for taking the time to review villa Mystique, I am happy you enjoyed the villa, our services and for giving us the trophy of the "best view". I am very sorry about the beach towel and towel situation that you mention- I will discuss with the maid today. The manager Peggy is excellent and very attentive. Everything at the house was in good working order. The location and view is prime - very close to St Jean (walking distance if you don't mind a steep hill). Common and pool areas are very nice and spacious. The housekeeper was also very good and came daily. The one suggestion I would have it better pillows - those were very uncomfortable, But that's a minor point on an otherwise excellent stay! Thank you for taking your time to review your stay in villa Mystique and your constructive comment. It was a pleasure welcoming you and your friends. We hope to welcome you again soon and I will make sure to check the pillows in all the rooms. Some of them are new, maybe too big- thank you for bringing this to my attention. Merci beaucoup. A bientôt. Our St. Barths vacation could not have been any better thanks to Peggy and Jerome. We stayed at the Villa Mystique for 4 nights and at Villa Sunset for one night and they were equally as fabulous. The location of the two villas is perfect with a wonderful ocean front view and close proximity to shops, restaurants, night life, and beaches. The outdoor living and kitchen areas at both of the villas are wonderful for entertaining and relaxing and the swimming pools are fantastic. The most relaxed we have been in a long time! Peggy and Jerome were so hospitable and were able to provide us with just about anything that we wanted during our stay. Truly one of the best vacations we have ever taken! Thank you for your wonderful review. We were thrilled yo meet you all. We are so happy that you enjoyed Villas Mystique and Sunrise, and the island life. Next time, we will have my Fender stratocaster waiting for you and we will organise a night concert and party! I have to practice my guitar and Jerome his singing... We send you all a lot of love and look forward to seeing you all soon. Our arrival in St Barths began with our meeting with Jerome at the airport. He promptly collected our luggage and led us to paradise. The view from the villa is surreal. We watched the planes throughout the day and the pictures from this elevation are pristine. A four wheel drive vehicle is a must, the location is just above Nikki Beach. The bedrooms were spacious ,clean and air conditioned. Babysitting and reservations were accomplished with the assistance of Peggy which made our stay effortless. This was a last minute trip but with the assistance of Jerome & Peggy our dinner reservations and babysitter were booked. Thank you Jerome & Peggy for the cherished memories ! 2 couples stayed 10 nights at Villa Mystique and we couldn't have been more pleased. As stated in other comments, Peggy and Jerome are excellent hosts, offering concierge-like services. The villa itself has an excellent location up the hill across from Nikki Beach, thereby allowing for vista like views of all St. Jean. The outdoor kitchen and living spaces are consistent with a Caribbean climate and casual lifestyle, and surprisingly we did not encounter many insects or bugs. We appreciated our hosts' receptiveness to our questions while still affording us privacy. Jerome's excursion to the caves off Shell Beach was a breathtaking experience that we'll all cherish. You won't be disappointed with this villa! The rate is based on the number of bedrooms occupied. This is a 5 bedrooms rate. The rate would be lower for a 2,3 or 4 bedrooms occupancy. Please let us know if you have special requirements. The rates are subject to change until the reservation is confirmed.